Twitch.tv is a popular destination to watch live streams of various video game and related broadcasts. Most Internet users tune in using a web browser, and that is working fine most of the time. Twitch used to use Flash exclusively on the site but has since then started to integrate HTML5 video streams on the site as well. Regardless of that, you may notice that the Twitch browser client can be quite the resource hog. While you may be able to adjust some settings, quality of stream for instance, to reduce its resource hunger, you may prefer a better way of streaming Twitch streams that don't tax the computer as much. Livestreamer Twitch GUI is a graphical user interface for the popular Livestreamer application. We reviewed Livestreamer before here on Ghacks. It is a command line application to watch Internet streams in your favorite media player on the computer. Livestreamer Twitch GUI makes things more comfortable by adding an interface to the whole process. You need to configure the program before you may use it. First of all, it is required to download it and Livestreamer to the system. Livestreamer is available for Windows and as source code, Livestreamer Twitch GUI for Windows, Mac and Linux. Once you have both on your system, you may want to check the settings to make sure everything is set up correctly. The frontend reminds you if something is amiss when you start to play a video as well. The preferences are quite extensive. I suggest you enable the advanced settings and features preferences at the top to display even more. Set the preferred stream quality. It is set to source by default, but you may change it to a desired quality. This is interesting if your Internet connection is slow or unreliable, or if you prefer maximum quality all the time. Livestreamer lists several parameters including the path to the livestreamer.exe executable, but also stream type and parameters. Videoplayer sets the media player that Livestreamer Twitch GUI will load the stream in. If you leave it blank, the default player will be used. Control various GUI related preferences. Change the theme from light to dark, enable or disable OS integration, and set refresh rates (off by default). Filter streams by language. You may remove broadcaster languages to filter out streams. Configure desktop notifications, for instance when favorites are streaming. Make sure you hit the apply button at the bottom of the page after you are done. The application displays a prompt if you miss it though. 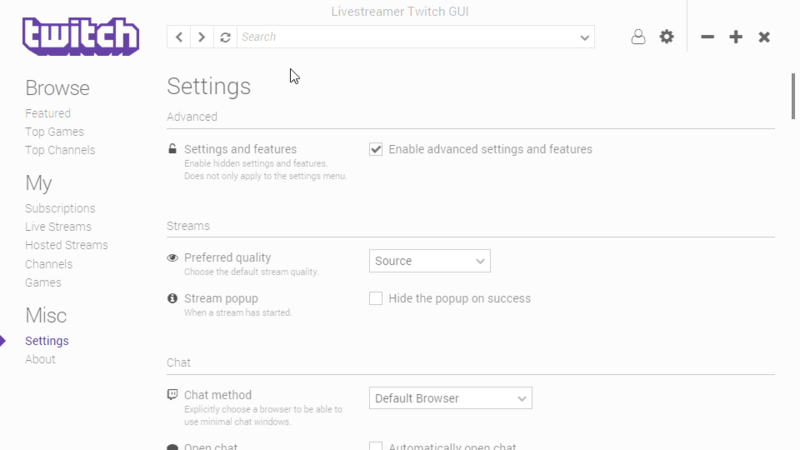 Livestreamer Twitch GUI lists several options to browse streaming channels on Twitch. You may use the featured, top games or top channels listings for instance, or use the search at the top for that to find specific streams. The account-specific section requires that you sign in to a Twitch account. You may then access your subscriptions, live streams, hosted streams, and favorites using the program as well. Once you have found a stream that you want to watch, you may simply click on it to start the process. If things are set up correctly, the stream opens in the default media player automatically. Livestreamer Twitch GUI displays options in its interface while the stream is playing in the main media player. 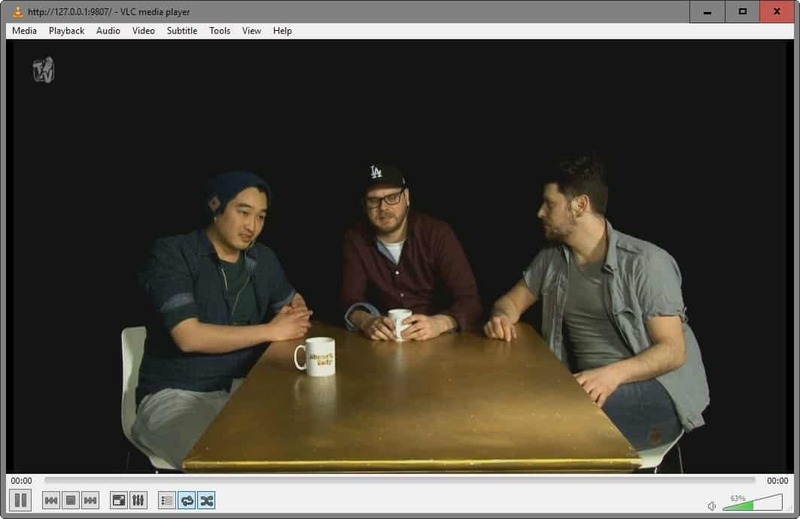 Since the stream is displayed in the media player, you won't get access to the chat for instance or other controls while using it. That's why an option to launch the chat is displayed by the program. You also find options to change the stream quality, and even stream only the audio. 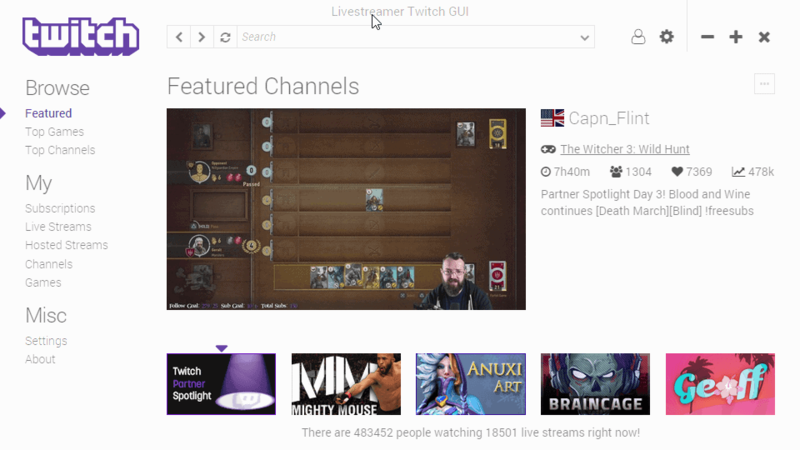 If you run into resource woes regularly when streaming Twitch content, you may want to give Livestreamer Twitch GUI a try. While it requires an initial setup to get everything going, it is not overly complicated and a one-time process only. 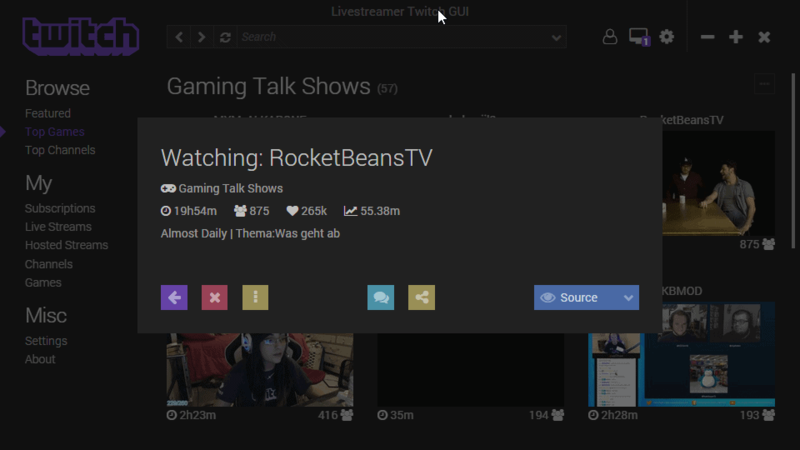 Livestreamer Twitch GUI is a graphical user interface for the popular Livestreamer application which sends media streams to the default video player on the system. I use Livestreamer Twitch GUI (LTG) everyday and can’t recommend it highly enough. It’s waaaay less CPU taxing then through the browser, the app itself sits in your icon tray and is extremely lightweight compared to leaving a browser open, it’s easily resizeable if you’re short on screen real estate, and a whole bunch of other QoL things. – the filter by language feature doesn’t work. According to the the LTG dev(s), Twitch broke something awhile back with the language categorization on their backend so the LTG can’t sort things properly. – Once you install Livestreamer, you can watch archived Twitch VODs without even going through LTG. Just google how to for the tutorial. It’s a simple commandline you can turn into a Windows shortcut and takes less than a minute. Be sure to look for a tutorial that includes enabling “seeking”. – The default video program for Livestreamer is VLC. VLC is nice but one of the more resource heavier video programs out there and doesn’t support all the command-line options for Livestreamer (like “seeking”). I personally use MPC-HC which is super lightweight and supports all the commands i’ve thrown at it. – NO ADS! Livestreamer bypasses Twitch’s ad injection system. This means streamers and Twitch doesn’t get $ if you use Livestreamer. Like everybody, I hate ads but the reality is things cost money to run so find ways to support Twitch and your favorite streamers by subscribing to their channel (the cut is 50/50). Donating only supports the streamer – Twitch gets 0. If you already sub to a/some streamers then you can use Livestreamer and LTG guilt-free! I use Livestreamer but the delay compared to the browser is horrible. With the browser there’s usually a 15 second delay between video and chat, but with Livestreamer + VLC it’s around 25 seconds. I have caching turned off so I don’t know if there is something in the config file that needs to be changed. Ah nvm, it’s probably just me. I use livestreamer in conjunction with a Firefox addon called “Open With”. I added the Livestreamer executable as one of the programs and added “%s source” as arguments. Now, I just browse channels like normal but instead of opening streams in a new tab, I just Right Click – > Open With -> Livestreamer and it’ll open the stream fullscreen on my second monitor in MPC-HC.